Aside from tradition, another reason to select a particular variety is disease tolerance or resistance. Tolerance is the ability of the plant to endure disease, while still producing some yield. Resistance is the ability to prevent or slow disease development, by way of naturally occurring plant properties. Many varieties have been “improved” through natural breeding methods for these traits. Selection of resistant cultivars can reduce the impact diseases may have on plant vigor and yield, as well as reduce or eliminate the need for chemical management practices. Disease resistance is especially important for the home garden, which many either cannot or prefer not to spray. No single cultivar is known to have resistance to all diseases of concern, and resistance is specific to a particular disease. Thus, gardeners should select varieties with resistance to diseases that are most common for their area, or those that have been diagnosed as an issue in the past. Common diseases of major vegetable garden plants are listed below. Information about which disease(s) a variety is resistant to can be found on seed packets or in catalogs. Disease names may be listed as an abbreviation. For example, the letter ‘V’ may follow the tomato variety name, indicating resistance to Verticillium wilt. 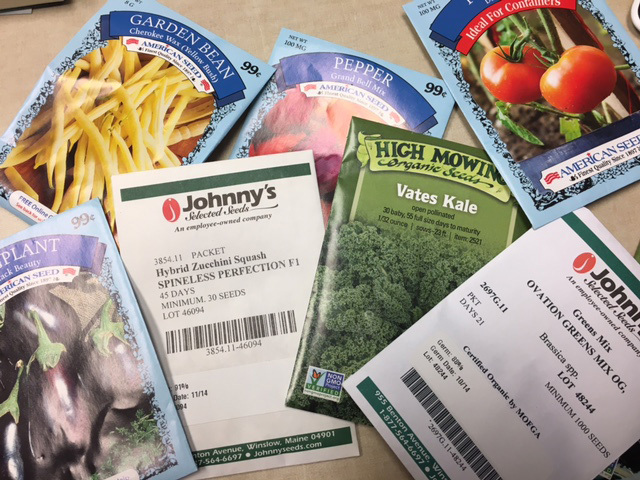 Seed catalogs and online retailers may detail disease resistance codes on a separate page. Take care to thoroughly read seed packets if purchasing in-store. Early blight is the most common disease of tomatoes in Kentucky. Tomatoes with some resistance to early blight are ‘Matt’s Wild Cherry’ and ‘Sun Gold’ (small cherry tomatoes), ‘Juliet’ and ‘Plum Regal’ (Roma size), and ‘Mountain Fresh Plus’ and ‘Iron Lady’ (slicing size). The bacterial spot pathogen causes the most common disease of peppers. Varieties with resistance to multiple races are ‘Allegiance,’ ‘Islamorada,’ ‘Naples,’ ‘Regiment,’ and ‘Vanguard,’ among others. ‘Aristotle’ also grew well in a recent variety trial. Downy mildew, the most devastating disease of cucurbits, can eliminate plants in a matter of days under wet conditions. Cucumber varieties with partial downy mildew resistance include ‘Sassy,’ ‘Calypso,’ and ‘Eureka’ (pickles) and ‘Poinsett,’ ‘Turbo,’ and ‘Thunder’ (slicers). ‘Sunray’ summer squash, and ‘Ambrosia’ and ‘Honey Brew’ muskmelons are partially resistant to downy mildew, but few varieties with downy mildew resistance exist for watermelons, pumpkin, winter squashes, and zucchini. Many powdery mildew resistant varieties of picklers, slicers, pumpkins, and squash are available. Varieties that are less susceptible to bacterial wilt include the pickle cukes ‘Cross Country’ and ‘County Fair,’ ‘Howden’ pumpkins, and ‘Waltham Butternut’ squash. All watermelons have natural resistance to bacterial wilt. Many lettuces have been bred for resistance to downy mildew. Consider head lettuces ‘Kweik,’ and ‘Pirat,’ green leafed lettuces ‘Black Seeded Simpson,’ and ‘Nevada,’ and red leafed lettuces ‘Galactic,’ ‘Red Zin,’ and ‘Rustica’ for their additional resistance to bacterial disease and/or white mold. ‘Regal’ and ‘Samish’ spinaches are resistant to downy mildew and white rust. Kale, collards, turnip greens, and mustards are naturally less susceptible to many diseases, so variety selection should rely on purchasing certified or treated seed and choosing varieties that will perform well under site and seasonal conditions. Most French and green beans have been bred for resistance to anthracnose, but resistance in other types of beans is unavailable. ‘Caprice,’ ‘Espada,’ ‘Kentucky Blue,’ ‘Romano II,’ ‘Volunteer,’ and ‘Goldkist’ are fungal leaf spot and/or rust resistant bean varieties, with additional resistance to various viral diseases (not common in KY). ‘Green Arrow,’ ‘Cascadia,’ ‘Sugar Daddy,’ and ‘Oregon Sugar Pod II’ are pea varieties suggested for their resistance to powdery mildew, Fusarium, and Verticillium wilts. Cabbage varieties ‘Bilko,’ ‘Blues,’ ‘China Pride,’ ‘Blue Vantage,’ and ‘Bronco’ carry resistance to a broad range of diseases, such as downy mildew, Fusarium yellows, and/or black rot. Broccoli varieties ‘Emperor,’ ‘Pinnacle,’ and ‘Green Magic’, as well as cauliflower variety ‘Majestic’ are resistant to downy mildew and/or black rot. ‘Grand Duke’ kohlrabi is resistant to black rot as well.